WD has returned to the consumer and small-business NAS market with its Sentinel DX4000, a 4-bay box that leverages Microsoft's Storage Server 2008 R2 Essentials operating system. A beefy piece of hardware, the DX4000 comes pre-populated with either two or four 2TB drives, retailing $950 for the 4TB version and $1500 for the 8TB version. Once the current drive shortage is over, buying the cheaper version and upgrading with an additional 4TB might be a smart choice. WD has equipped the DX4000 with state-of-the-art tray-less bays, which simply slide into the drives, as well as dual gigabit Ethernet ports and dual USB 3.0 ports. The Ethernet ports provide failover protection in case one connection goes down, but they don't currently support aggregation for increased performance. USB 3.0 means faster local backup of the box to leave the DX4000 more free to concentrate on serving files or backing up PCs on the network. The DX4000 even has dual AC jacks, though only one power brick. Storage Server 2008 R2 Essentials is more capable and much easier to install than the Windows Home Server OS that some cheaper NAS boxes were employing a year or two ago. 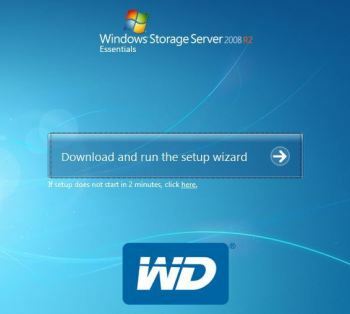 Where WHS required an install disc, Storage Server 2008 has all of its software on board. Surf to the DX4000's IP address, displayed prominently on the unit's front panel LCD, and you're prompted to download the install routine. After a minimal setup routine, the server will be initiated. Once initiated, you download the Connector software from the DX4000 and install it on your local PC. You may define users and shares, schedule backups, and enable the media server and the like. But if you choose not to do so, storage on the unit is available immediately to anyone with the password and Connector software installed. Online backup is in the works for the DX4000 and should be ready by the time the DX4000 actually hits stores, but the best feature at the moment appears to be remote imaging of local PCs onto its platters via the installed Connector software. If you're looking for an easy-to-setup automatic backup system for the PCs in your office, you'd be hard-pressed to find a better-looking one than the DX4000. SS2008 also automatically configures the drives to an appropriate RAID level, and will reconfigure as you add drives. With two drives on board, the default is RAID 1 mirroring. Add a third drive and the unit will switch to RAID 5. Though PCWorld hasn't had a chance to run the DX4000 through its official tests, I did some unofficial copying, and the DX4000 appears to be a good performer. It wrote some 15GB of mixed large and small files to its drives at 47.5MBps and read them back at about 66.8MBps. Those are near the mean for a quality SMB NAS box, and more than adequate for any intended role. Though not currently the most feature-rich of SMB NAS boxes, the DX4000 covers the basics well, and it certainly appears to be the easiest for non-IT types to install and configure. WD also offers advanced service plans, including overnight parts replacement, to augment the DX4000's standard 3-year standard warranty. It's not cheap, but the DX4000 appears worthy of inclusion in any NAS purchasing conversation.